Much-loved genre director John Carpenter was slowing down his output and contemplating getting out of the business by the mid-'90s after the underperforming Village of the Damned and Escape from L.A., he ducked out of the major studio rat race to make Vampires, a long-gestating adaptation of the 1990 John Steakley novel Vampire$ that ended up veering wildly from its source material after a similar opening sequence. Carpenter's adoration of westerns (already in evidence with his Howard Hawks influences in The Thing and Assault on Precinct 13) really came to the forefront here for a dusty, sun-drenched, Sam Peckinpah-inspired tale of bloodsuckers terrorizing the American West. 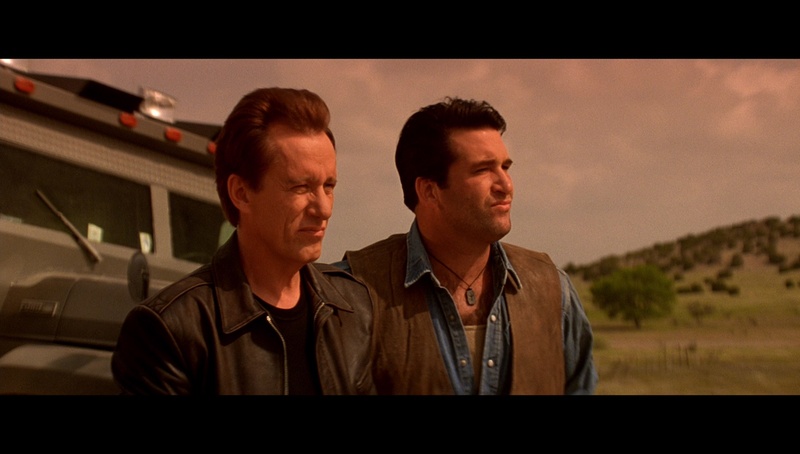 A vampire-hunting squad headed by Jack Crow (a perfectly cast Woods) and his right-hand man, Tony (Baldwin), cleans out a nest of vampires in an abandoned desert house in New Mexico. However, their celebration afterwards turns into a bloodbath when vampire master Jan Valek (Griffith) crashes the party and kills all of the hunters except for Jack and Tony. 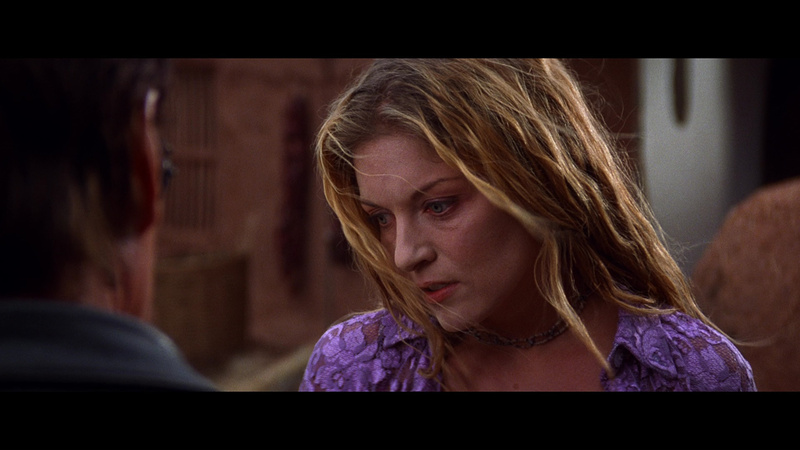 One of their prostitutes for the evening, Katrina (Twin Peaks' Lee), also makes it out alive but suffers a vampire bite that establishes a telepathic link with Valek. 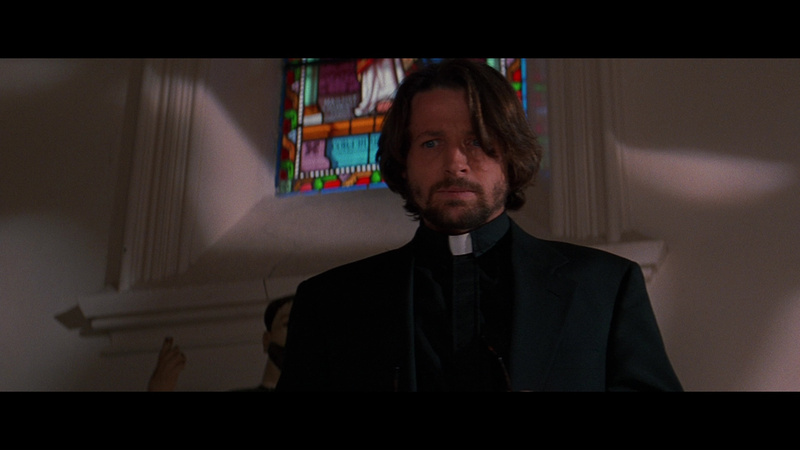 The team's sponsor, the Catholic Church, assigns a new priest to accompany them, Father Adam (Guinee), whom Jack welcomes by repeatedly beating him up. Soon a plan emerges to stop Valek from performing a ritual involving the mystical Bérziers Cross to change the nature of the vampire population forever. 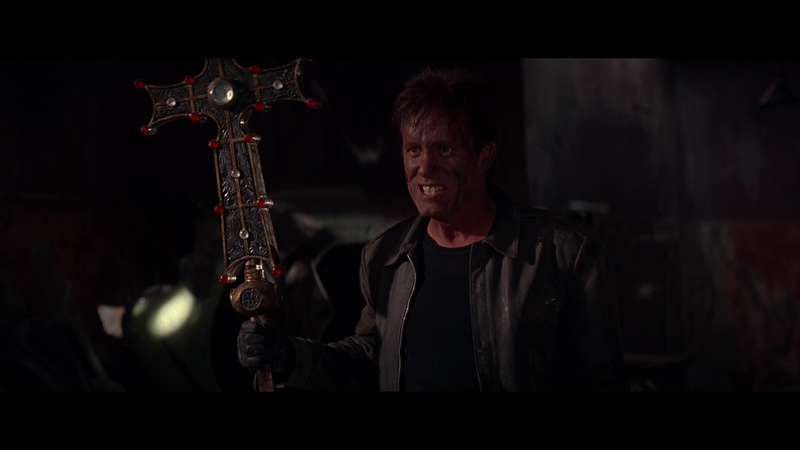 There are a lot of fun ideas swimming around in Vampires, and for the first twenty minutes or so they pay off in fireworks with Carpenter delivering some of his most energetic filmmaking of the '90s. After that it becomes a bit more uneven thanks to some production issues (the budget was hacked down by two-thirds shortly before filmed, requiring some major narrative surgery) and some iffy casting with Baldwin in particular feeling like he was about 60 names down on the list of preferred choices. 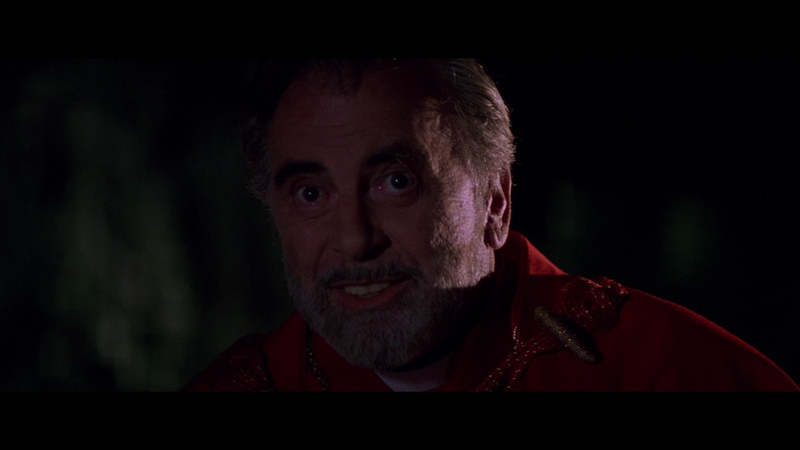 It's amusing to note the return of Carpenter's conspiratorial angle on Catholicism here after Prince of Darkness with a hammy Maximilian Schell of all people turning up in a minor but key role, which plays uncomfortably next to Wood's rampant verbal and physical abuse ("no-good, half-dead whore") heaped on the sole significant female character. Fortunately the underrated and always fearless Lee is so good she manages to sell the role with all she's got. Once again Carpenter provides scoring duties himself, churning out a fun soundtrack that sounds like an infectious jam between Ry Cooder and Tangerine Dream. Cinematographer Gary Kibbe (In the Mouth of Madness) manages to wring a huge amount of style out of what were apparently limited resources, giving the film an appropriately desolate and expansive feeling while frequently employing intense, stylized filters that split the screen into different bands of color a la Vittorio Storaro's work on Ladyhawke. As far as vampire westerns go it definitely isn't Near Dark, but the film's charms have aged well enough over the years with its strong points easier to appreciate. 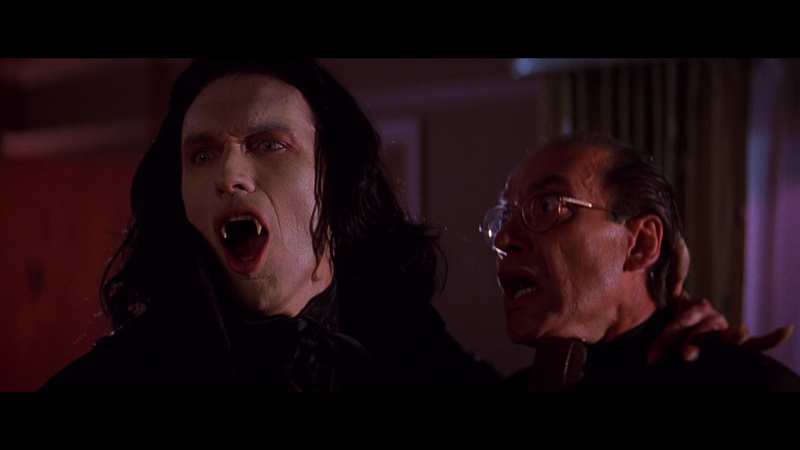 Vampires has always been treated quite well on home video, beginning with a top-class DVD release from Sony early in the format's history in 1999. (Columbia Pictures grabbed the film for distribution in most countries.) The transfer and Dolby Digital 5.1 audio were state of the art for the time, and the audio commentary by Carpenter is engaging enough except when he resorts to play-by-play descriptions of the on-screen action. In 2015, Twilight Time released the film in a limited edition Blu-ray that sold out fairly quickly. A new HD scan was commissioned when the preexisting one prepared by Sony was deemed insufficient, and the results are striking with the intense hues of orange, red, and brown (and all the gradations in between) practically popping off the screen. The DTS-HD MA 5.1 and 2.0 audio is a monster as well with plenty of gunshots and directional music effects keeping your speakers hopping throughout, and optional English subtitles are provided. The Carpenter commentary is carried over, and his score is also presented as an appreciated isolated track. A6-minute, making-of EPK is also included. In 2016, Vampires made its UK Blu-ray debut from Indicator in a greatly expanded, dual-format special edition that will likely remain the final word on the title for quite a while. The transfer appears to be derived from the same master, but a more generous and sensitive compression job results in a perceptible uptick in detail as well as a more natural sense of film grain texture. It's more evident in motion, but here's a sample grab from the Twilight Time disc compared to the first one seen above; the Twilight Time was certainly no slouch, but this release slightly edges it out. Both 5.1 and 2.0 options are present here (with updated and improved English subs) along with the commentary, isolated track, and making-of featurette, but a substantial amount of new material is added as well. The theatrical trailer finally makes its appearance here, along with 9 minutes of B-roll footage, a 9-minute sample of interviews (with Carpenter, Woods, Baldwin, and Lee), and part one of The Guardian interview with Carpenter (38 mins. ), from the director's Q&A with Nigel Floyd at the National Film Theatre in 1994. Obviously he doesn't discuss this film since this was held around the time In the Mouth of Madness was released, but it's a fun chat as he covers his career up through 1983 with stories about everything from Dark Star and UCLA to his much-loved Kurt Russell classics. As usual Indicator leads the field in liner notes booklets with a beautiful insert featuring an essay by Kim Newman (who does a good job of contexualizing the film's treatment of vampire lore while placing at the forefront of the following decade's wave of vampire multi-title sagas and assessing this film's strengths and cons) and a 2015 Carpenter text interview from Filmmaker about casting Woods (who got to do an improvised take of his scenes after performing them as written), the amusing cameo by Frank Darabont, and his thoughts on the major home video resurgence of his work. Updated review on January 29, 2017.